The jacket is in mint condition. 80% wool 20% nylon. 15" shoulder to shoulder. 29" sleeve length from neck. 24" length. Adorable army-inspired field jacket with brass stud detail over right breast pocket. Hood attached but can be rolled up and stored in collar. J Crew Field Jacket M. Condition is Pre-owned. Shipped with USPS Priority Mail. Condition is Pre-owned. It is, however, possible that I may unintentionally overlook any flaw or imperfection. J Crew Mercantile Quilted Vest Gray Womens XL. Condition is Pre-owned in excellent condition. Zipper closure . Shipped with USPS Priority Mail. I wore this coat once. Nothing wrong with it, it just ended up not really being my style. It’s literally sat in my coat closet. Somewhat light weight, but not the lightest. Would be good for a 30 degree to 55 degree day, but a 10 degree day. Any other questions, just ask. 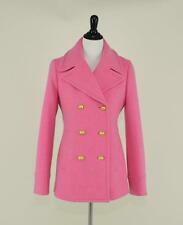 J.CREW Women's Pink wool Peacoat Size 2 Long Fitted. Shipped with USPS Priority Mail. J Crew Field Coat. Machine wash. MATERIAL - Cotton. Waist belt. Welt pockets. Fully lined in a beautiful blue and white striped ticking. Viscose/silk - makes for avery beautiful drape on the body. This jacket runs small. Will fit a size 8/10. Body length: 21 1/4". Size large. Perfect for spring. Weight of jean jacket. Never worn. Lots of beautiful bright colorsJcrew Paisley Jacket. JCrew Boyfriend Military Downtown Field Jacket SZ XS Extra Small Olive Green. Resin Coated Canvas. or concerns before, during, or after the sale. We will respond quickly! We always strive for a 5-star buying experience! This black and navy blue tipped twill jacket from JCREW is in excellent condition. It features You found it. Machine wash. Total Length: 25". Hits above hip. Women’s J Crew long, dark brown pea coat. Size 8. Gently worn condition! Button front. Two front pockets. Super soft & warm! Pet free and smoke free home. J. Crew Black Waxed Cotton Jacket Womens XS Navy. Condition is Pre-owned. Shipped with USPS Priority Mail. Very gently worn- Jcrew Midnight Tweed Jacket Size 4. Condition is Pre-owned. Shipped with USPS Priority Mail. EUC long wool coat with grey satin lining. Are you a bit chilly??. Get warm in this fashionable corduroy coat! I can just see it, you wearing this coat, strolling along the louvre in Paris, France! Of course, I’m sure you would look good in it anywhere 😉. PRE-OWNED - In Great Condition J. Crew Black Quilted Jacket - Size: L.
Navy blue. Lightweight wool blend (98% wool, 2% spandex — very comfortable with the tiniest bit of stretch). Style # 05157. Perfect, do everything blazer. Fully lined. Sleeve buttons and front pockets are real. Pattern = Ruffles. age group = Adult. Color = Gray. Category: Jacket. Pattern = Button(s). Size = SIZE 10. J Crew Plush Fleece Teddy Jacket. Our favorite (and fuzziest) new layer, this jacket is made from a sherpa fabric that's so fluffy, it feels like a wearable teddy bear. Sophisticated design details like dropped shoulders and an easy cocoon-like fit keep it totally grown-up. Original owner, worn twice: J.Crew Sz 8 Chino Ruffle Jacket Tan. 4 pockets (see photo) and sturdy hook and eye closures. Machine wash. Body length: 21". Sleeve length: 31". Beautiful preowned Jcrew Capella wool cashmere Nello Gorilla coat size 4. There is a spot on front of coat with a little wear to wool I tried to show in photo. Brown J Crew tweed coat. Thinsulate lining. See last pictures for tears in lining under arm and near collar. Coat also has piling on sleeves. Beautiful tan color and substantial weight, satin lined, double breasted. Beautiful pleated detail on back of collar and well made all around. Was a staple in my wardrobe, but just not my size anymore. Rare J.CREW Camel SCHOOLBOY Blazer 92480 Size 10 WoW! Size 4, Excellent Condition. 100% Wool, Lining 100% Acetate. Length (top of shoulder to bottom) 24". Good condition. Gently worn. Gray color, collared with 1 button closure, long sleeve, unlined blazer with front pockets. size Small. .
Button Closure. Sleeve Length: 23". Total Length: 26". If an item were in excellent condition with an easily replaceable button then it would be graded as a FAIR. Very light wear. VERY GOOD–. Well cared for. Slight discoloration to interior lining. From smoke and pet free home. Material: 100% wool. We hope it's a good fit for you. Coats are an important addition to a woman's wardrobe. The perfect jacket, parka, trench or raincoat will vary per an individual's daily routine, fashion preferences and where they live. There are a number of different varieties sold by eBay vendors. 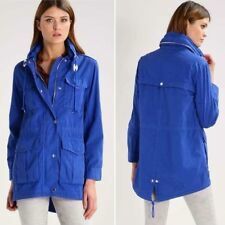 What are Some of the Types of Women's Coats Available? Coat Styles: When shopping for a new coat, deciding on your preferred style is an important decision. Some of the most popular styles include: trench coats, peacoats, double-breasted coats, denim jackets, and fur coats. Fabric Types: Some of the common fabric types used for women's vests and jackets include: wool, boucle, wool-blends, fleece, and denim. Puffer jackets and waterproof raincoats made from a variety of comfortable synthetic materials are also available. Minimalist or Ornate: When shopping for women's jackets from eBay vendors, you can select between simple, monochromatic designs or items featuring ornate textures and patterns. How Should You Select Outerwear for Women? Ideal Silhouette: You may like to consider the particular silhouette you're hoping to create when selecting your jacket. For example, cropped jackets are often favored by those with long torsos, whereas belted trench coats create an hourglass silhouette. Blazers help to maintain a fitted and workplace-friendly look, for those concerned about appearing 'boxy'. Functional Needs: Consider your functional needs and the climate where you live when selecting new outerwear pieces. Where will you predominantly be wearing these items? Do they need to be work appropriate? Do they need to be waterproof and easy to clean? Layering Needs: When selecting the size of your winter apparel, also keep in mind if you'll be wearing multiple layers underneath the jacket, to ensure a comfortable fit. See manufacturer site for size and measurement details. What are Some Ways to Look Fashionable In Outerwear During Winter? Consider Contrast: Winter clothing doesn't have to be boring. Create outfits featuring contrasting textures and colors to add vibrancy to your look. For example, you might like to consider a J.Crew textured teddy coat or a J.Crew Daphne green tweed coat. Use Accessories: Accessories, like beanies, gloves and colorful rain boots, are a fun way to add fashionable flair to a winter outfit. See the manufacturer site for size details. Content provided for informational purposes only. eBay is not affiliated with or endorsed by J.Crew.